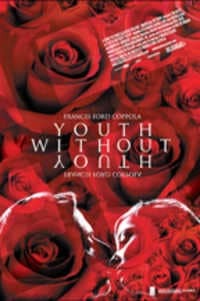 Don’t be misled by the title, Youth Without Youth is not a movie about Hollywood’s obsession with canceling old age, the plastic surgery wish fulfillment of facelifts and tummy tucks, or age forty as the new thirty in L.A. Since we’re talking Francis Ford Coppola here as the writer and director of this profoundly personal, psychologically and emotionally symbiotic literary adaptation, let’s just say it’s suggestive of perhaps late midlife crisis Godfather on Viagra. More to the point, the anti-hero of Coppola’s lushly photographed but dreary adaptation of Mircea Eliade’s out-of-print Romanian novella of the same name, is Dominic Matei (Tim Roth). The clinically depressed pre-WW II Bucharest seventy-year-old poet in the midst of strategizing his own suicide, is by chance struck by lightning and burnt to a bloody crisp while out for a stroll in the rain. Near death and confined to a hospital, Matei and his odd clinging to life, especially in light of his earlier longing to part ways with existence, is considered by doctors all over Europe to be nothing less than a miracle beyond the understanding of science. When his head-to-toe bandages are removed, Matei finds himself nearly half a century younger and all the nurses making moves on his renovated physique. Even his teeth have unbelievably vacated his mouth and fallen to the floor one by one, as he sprouts a brand new set of choppers. But the chronologically challenged Matei is also sexually reinvigorated, and even with invading Nazis and their scientists closing in on him to study this baffling case, he’s far more distracted by his crush on twentysomething Veronica (Alexandra Maria Lara). She’s a flaky schoolteacher who is also struck by lightning but ages in the opposite direction, and starts speaking in subtitled ancient Sanskrit while dealing with menopause. And while Matei dodges Hitler’s gestapo and medics, the audience gets it long before he does that a new lease on life is far from an option to buy. Not to mention that if your former alienated youth wasn’t a bed of roses, revisiting it may not be much of an improvement. Screen legends like Coppola, Sidney Lumet (Before The Devil Knows You’re Dead) and Anthony Hopkins (Slipstream) all seem to be looking back on their lives in their very personal movies lately. And turning inward while mulling literally and metaphorically at this point, the meaning and value of their time spent on earth however celebrated with mass adulation, and anxiously questioning, what was it all about. And the results have indeed been mixed, to say the least. Apocalypse Then, Redux.